Analysis Written off by pundits and the markets, barely a day goes by without a fresh requiem for RIM. A recent example comes from Jean-Louis Gassee in Saving Private RIM. It’s a good analysis - you never get anything less from Gassee - but astonishingly BlackBerry Messenger (BBM) barely gets a mention. Of all RIM’s assets, the value of BBM is consistently underestimated. BBM today is a thriving social network that’s almost as large as Twitter. To ignore BBM is like describing Porsche as a luxury leather seat manufacturer – Porsches have terrific bottom cushions - and completely discount the frame surrounding it. Yet ignore it, they do. There’s a wilful blindness when affluent middle-aged men (invariably white) discuss RIM. Perhaps it's because BBM is used by teens. In that case, what does a tech biz analyst in his 40th floor corner office, idly planning a skiing getaway, know about the lifestyle of a 15-year-old catching a bus on the street far below? It’s a serious analytical failure and here I will give it into some context. Dalton Caldwell is making a brave attempt to launch a self-financing social network called App.net. I’d add platform to that description, if a) the p***f**m word wasn’t already beaten to death and b) anyone could understand what quite what makes App.net a p***f*** - and I certainly don’t. App.net is currently riding a wave of good will from people fed up with intrusive Twitter and Facebook data gathering, and has met its initial $500,000 fundraising target to get it started. The price of admission to App.net is $50 (£31), which is a mistake: it’s far too high for most casual users. Successful communities such as Something Awful and Metafilter also offer a low or no-ads experience and charge much less. Metafilter charges a lifetime $5 to deter griefers, and the phenomenally popular Something Awful has a range of signup options starting from $9.95. Neither has any silly, arbitrarily limits on the length of posts. And once you join, you'll find they’re both full of people. 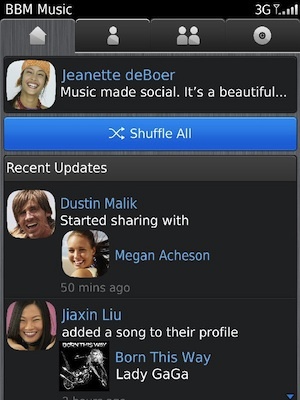 BBM is a social network too, one that’s bundled with hardware and typically costs £5 a month to use BlackBerry services. I mention this merely to make a price comparison point. Gassee downplays the importance of BBM by brushing off the importance of BBM's unique features. Apple's iMessage performs the same job, he suggests. But you only need to see people using their Berrys to appreciate the difference. There’s not only a huge shortfall in functionality, that Apple would need two or three revisions of iOS to fill, but BBM is completely central to the communication experience on a Blackberry: all other activities, ranging from calls to sharing music, spin out of BBM. It is the best communication user interface I’ve ever seen, and adds a dimension that no other system can match. As a result, nobody is as "engaged" as a BBM user. There are reasons for this devotion other than BBM. Blackberry’s user interface is very well designed, with lots of shortcuts, and while the underpinnings are archaic and unreliable – hello, Battery Pull - the software is working with you rather than against you. It is much more productive than Windows Metro, which is much admired by critics (including this one) for its originality. BlackBerry OS 10 adds some new good ideas too. RIM’s challenge is whether to open up its unique social network to others, and if so, how to do it. Licensing the OS and apps to all comers would, if previous attempts were repeated, end in disaster. Licensing BBM itself, in an equally uncontrolled manner, would have a similar effect: BBM is the centrepiece of the experience. But selectively licensing the OS in partnership with others could allow both licensee and partner to prosper. Fan site Crackberry.com interprets recent remarks by RIM CEO Thorsten Heins (to the Telegraph) as seeking help in low-cost manufacture. But it doesn’t stop there. The bleakly uniform design of today’s smartphone slabs feels very odd – the preceding decade taught us how much people appreciate choice and variety of a device that’s glued to the body for our waking hours. Sony could help here. When it partnered with Palm a decade ago it cranked out a number of interesting designs. Sony, with a rich portfolio of design patents, would be the ideal RIM partner – if only they could agree on how to divvy it up. It’s a true media platform, too, it's ad free, and has real security built in. It’s a quite fantastic asset for a "doomed" company to have - and it’s RIM's to throw away.